Saturday evening I had plans to run several errands and get lots done after the kiddos went to bed. Also, a LQS was having Midnight Madness, and I was looking forward to heading over there to see the sales. Unfortunately, Mother Nature didn't agree. About 5:30 p.m. it started to snow around here. Not the kind of snow that you say, "Oh look, it's snowing outside." It was the kind of snow where you say, "Ack, that's awful. I'm sorry for anyone who has to be out in that." Our neighbor said he measured 17" by Sunday morning. So instead of heading out to run errands, I stayed inside, drank hot chocolate and finished up this guy. This is one of my favorite pillows ever. I love it--almost so much that I don't want to put it in the living room where little dirty hands can get to it. 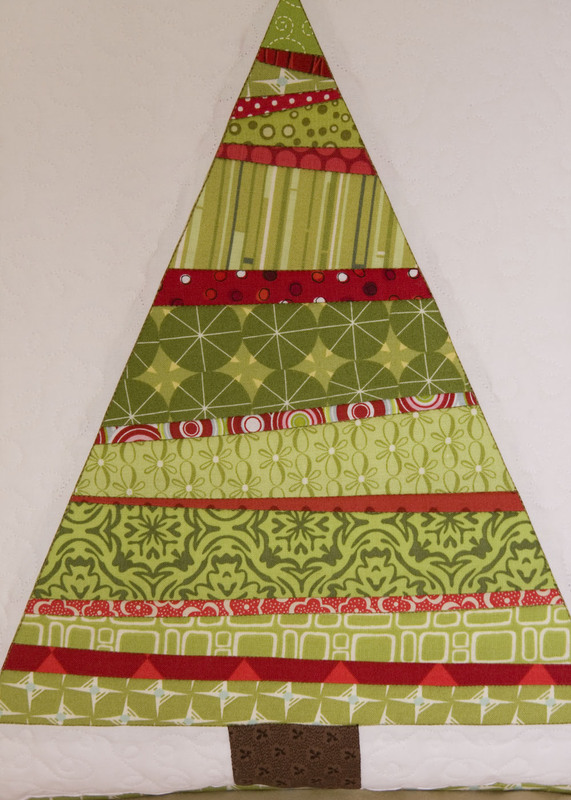 I paper-pieced the tree. 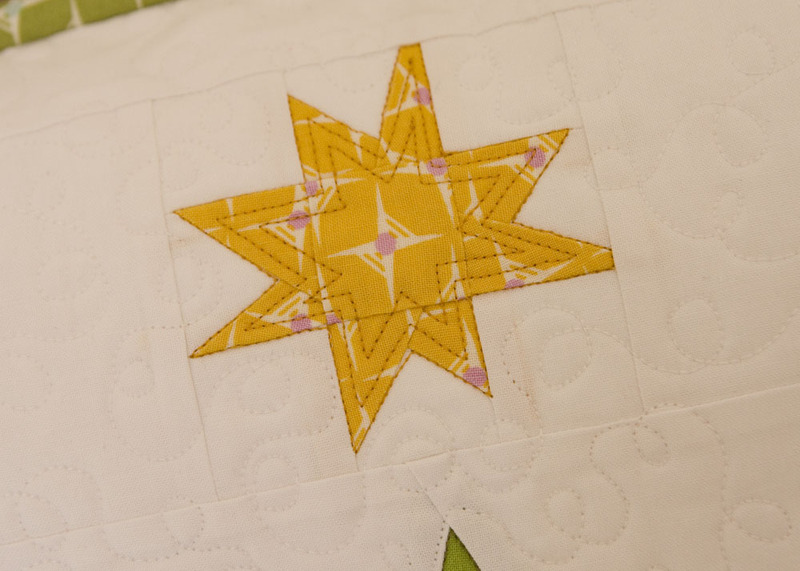 It was inspired by this quilt from Stitches and Scissors. I adored it when I saw it and thought one of those blocks would make a perfect pillow. Now onto other projects. I finished quilting a quilt this morning during nap time. I'll hopefully finish it up this evening and post some pictures after Thanksgiving. I have another quilt basted and ready to quilt, but I don't think my back and shoulders can take it. I might need a break for a day or two. I need to learn how to stop tensing my shoulders while I free-motion quilt. I'm always wishing for a massage by the time I'm done. Ohhh! I LOVE IT! 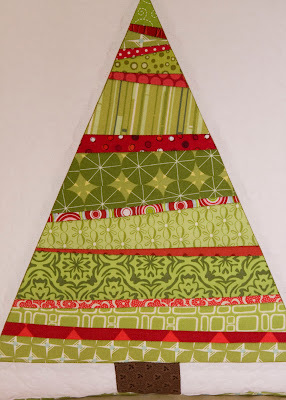 I need to learn paper piecing... Looks brillant! Wow - that is just awesome. Love the fabrics, love the star, love everything! Great job! That star is perfect. So, so cute. I want one! I really love this pillow. Now I need to make one. SO pretty! Kati, you are so talented! This is one of the prettiest Christmas pillows that I have seen!! The red accent is perfect. I might have to borrow this idea for a pillow! 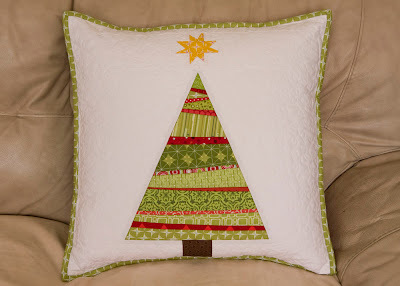 I just found the picture on flickr and followed it back here to let you know how much I love love love this pillow!!! Happy Quilting Anniversary to Me!